Yesterday, Universal Pictures moved the release date for Fast & Furious 9 up nearly a full year, from April 19, 2019 to April 10, 2020, with speculation surfacing that the release date shift was due to The Rock, a.k.a. Dwayne Johnson, signing on for a Fast & Furious spin-off movie that would feature both himself and the Deckard Shaw character played by Jason Statham. 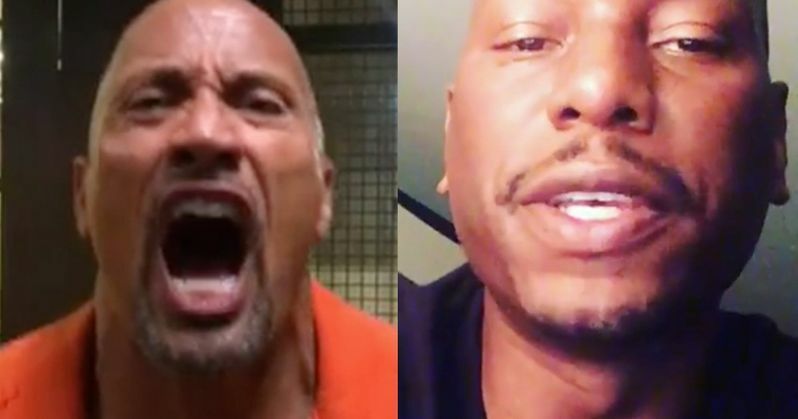 Last month, Tyrese Gibson called out The Rock on his Instagram timeline for setting up a "Hobbs movie," stating that he ignored the "heart-to-heart" conversation they had, where Tyrese apparently tried to talk him out of the spin-off. While Universal hasn't formally announced the spin-off, it seems it's happening, with Tyrese Gibson calling out The Rock for putting himself above the "Fast Family." "PSA Congratulations to @TheRock and your brother in law aka 7 bucks producing partner @hhgarcia41 for making the Fast and the Furious franchise about YOU. And like you, DJ even if they call I will not be deleting this post. Gn folks see you in 2020 April #FastFamily right? Nah..... it's about #TeamDewayne #3yrs will it be worth the wait? #NoShaw just Hobbs will this be another #BayWatch? Guys guys just relax I'm just a passionate film critic"
There has been no public response from Dwayne Johnson as of yet, who is currently filming his new action-thriller Skyscraper for Universal Pictures. Universal Pictures gave no specific reason for the release date delay, but this "feud" all started when Dwayne Johnson posted an Instagram photo of the actor at his now-infamous "GSD" (Get S--t Done) table, where it appeared he was signing a contract. Tyrese then posted publicly in a comment on the Instagram post, stating that he only resorted to posting on his timeline because he wouldn't answer any of the text messages Tyrese was sending him. Regardless of how this all plays out, this certainly isn't the first time Dwayne Johnson has been involved in a feud in this franchise. Dwayne Johnson made headlines last year when he posted a rather scathing message on social media, calling some of his male co-stars "candy asses." It was later revealed that the target of this post was none other than Vin Diesel, who has developed a notorious reputation for making stars and crew members wait for him to get ready for a shoot. It even got to the point where both stars reportedly had to be separated during the press tour for The Fate of the Furious, which pulled in $1.2 billion worldwide, but we reported in April that The Rock and Vin Diesel ended their feud, with both reportedly set to return for Fast & Furious 9. Oddly enough, yesterday's report on the release date delay from The Hollywood Reporter mentioned that Vin Diesel is returning, but said it wasn't confirmed yet if Dwayne Johnson would be back. We also reported last June that Michelle Rodrguez may leave the franchise as well, revealing in a cryptic Instagram post that the filmmakers have to start treating the women better, or she, " might have to say goodbye to a loved franchise." There has also been talk of bringing back Sung Kang's character Han for Fast & Furious 9, despite being killed off in Tokyo Drift, but that has yet to be confirmed either. As for the fallout from this Tyrese Gibson Instagram post, we'll have to wait and see if it affects his future with this lucrative franchise, with just two more movies left before it comes to a close.